Choosing the right front fence design for your house is a difficult task. What makes it difficult is that you have to weigh up functionality with aesthetics. This doesn’t often happen when it comes to home renovations and design. For instance, when you’re choosing the colour for the paint in your lounge room, you don’t really have to consider its functionality. Going beige instead of yellow won’t mean that your walls will fall down. But, when it comes to choosing designs, you have to ask yourself a few questions before you make your decision. We’ve put together our list of tips and tricks to help you choose the right fence design, once and for all. What is My Front Fence For? The purpose of your fence will inform your design choices. If you have young children or pets, then you obviously have to design your fence in order to keep them from running out on the road. If the purpose of the fence is to give you some privacy or security then you need to design in such a way that will block you from the gaze of the outside world. On the other hand, if you simply want a fence as an ornament to the front of your house then your design options are far more open. It’s all about pinning down the purpose first and deciding on the design after. For example, if you need a fence for security it needs to be high, have no places that make it easy to scale and have a strong, lockable gate. If you want a fence for privacy it has to be tall or you can go with a stepped design so only the parts that you want to be blocked are hidden. If you’ve got a dog that loves to dig, you need to make sure that the fence goes a couple of feet under the ground, if your dogs a jumper it needs to be higher than it’s maximum leap and so on. What is the style of your home? Is it a traditional colonial cottage? A red brick home? Or a striking, modern home with big slabs of render and blocks of colour? Once you have figured out the style of your home, you have to ask yourself if you want the fence to blend in with the home or contrast with the home. If you want your fence to be a showpiece you’ll have to make it contrast at least a little bit. That doesn’t mean you have to put a white-picket fence out the front of a modernist home it just means you have to ensure it’s designed and styled enough to hold its own against your house. 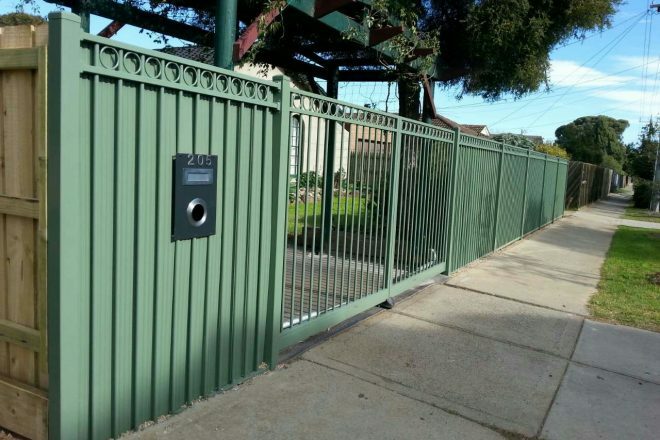 You have to consider the elements when you are designing your front fence. If your house is at the end of a street that turns into a wind-tunnel when a Northerly blows through, then its probably not a good idea to go with wooden-pickets. Steel fencing with gaps in it may also mean that you have to learn how to sleep through some serious howling when that Northerly wheels around. If you’re unsure about the best options for dealing with wind you should contact a fencing contractor, like Everlast Services. Do you live on a secluded little avenue? Or do you live on a bustling main road, frequented by trucks or intoxicated individuals coming home from the pub? If you live on a main road you need to build a fence that can block out some of the traffic noise as well as the shrieks of inebriated amblers. A high-steel fence is a fantastic soundproofing option. On the other hand, a high-steel fence on a quiet avenue could mean you miss out on the view of the beautiful old oak-tree across the road. Firstly, you have to ask yourself – do I want a gate or not? If you don’t, move on to the next question. If you do, you have to realise that the gate is the centerpiece of your front fence, no matter how much you blend it in; people will still be drawn to it. If you want a truly striking fence, focus on the gate. If you want a simple fence, blend the gate into the fence as much as you can. There are two questions here. What colour is your home and what colour do you want your fence to be? A traditional style home, such as a cottage or a homestead, will work better with a lighter colour. However, if you want your fence to be a feature, you can always contrast the colour of your fence and your home. It’s important you are safe in your contrasts. If you go to far you will just create a mismatch between your home and your fence, get it right and you will have a new feature for your home and you will highlight the features of your home. After asking yourself those questions, you may find that you have even more questions. If you do, contact the talented team at Everlast Services and they’ll be more than happy to give you a few tips and lay out the best options for your home.